Microsoft has already announced the General Availability for SharePoint Framework. We can develop modern web parts for SharePoint using SharePoint Framework (SPFx). Web Parts developed using SPFx can be added to modern view pages as well as classic pages in SharePoint. A. Install Node Dependencies for SharePoint Framework. 1. Download and Install Node.js. 2. Open command prompt and execute below commands one by one to install bower, grunt-cli and yeoman respectively. 3. 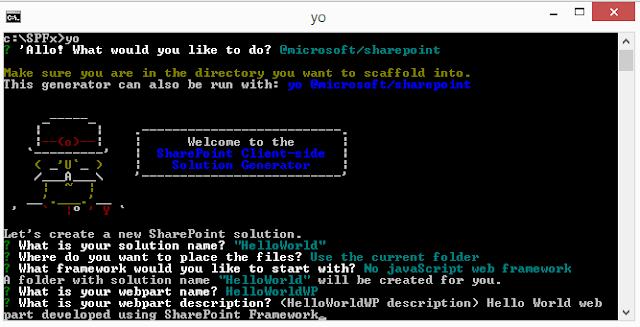 Install Microsoft SharePoint Generator by executing below command in command prompt. 4. Install Gulp by executing below command in command prompt. B. Install desired source code editor (e.g. Visual Studio Code, ATOM, Sublime). A. Open Node.js Command Prompt. B. Navigate to the directory where you want to have your solution located at (e.g. cd c:\SPFx). D. This will list down the available generators. As we have already installed Microsoft SharePoint Generator, this will appear as an option here. E. Select “Microsoft SharePoint Generator” and press enter. i. Solution Name – e.g. “HelloWorld”. ii. Select “Use the current folder” option. v. What is your webpart description? – e.g. “Hello world web part developed using SharePoint Framework.”. vi. This will take a few minutes to prepare the solution. 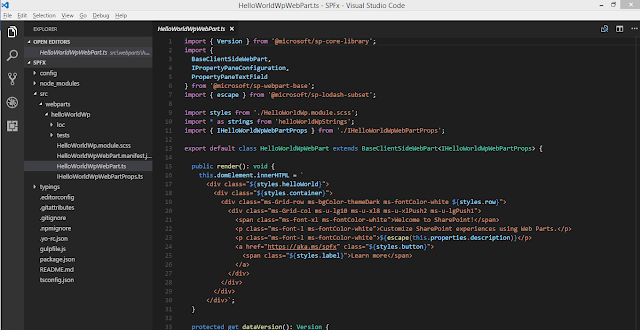 H. To check the solution, open the solution in Visual Studio Code from file system directory (C:\SPFx) where we created the solution. A. Open Node.js Command Prompt and navigate to the directory where we created the solution (C:\SPFx). So, the environment is prepared and verified for SharePoint Framework (SPFx) development. For verification, we have used default Hello World web part, we can develop the web parts as per requirements.